In my last article I looked at various builds featuring Zoroark-GX, since Zoroark-GX variants are arguably the most popular decks currently in Standard. This week I'll be taking a look at two of the other top archetypes of the format and we'll see how they stack up against the Zoroark-GX decks and against each other. The first deck we'll take a look at recently took 3rd place at the Memphis Regional. Here it is. Key cards in this deck are Diancie Prism Star, Professor Kukui, Choice Band, and Beast Energy Prism Star. All of these cards grant you additional damage when you attack, which is important as this deck wants to win as quickly as possible. 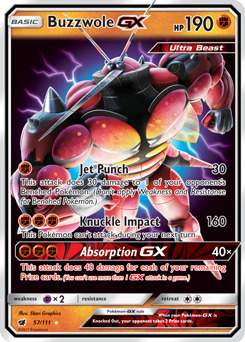 Both Buzzwole and Buzzwole-GX have attacks that only require 1 Fighting energy. That's important because you will usually want either of them to be your active Pokemon if possible. 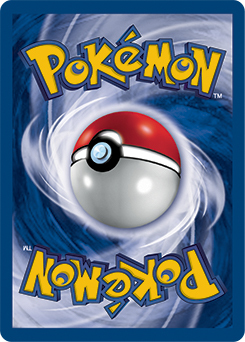 Many of the other Pokemon in the deck are there simply as supporting members. Tapu Lele-GX is a bit of an exception, as its Energy Drive attack can be used if times are desperate. A lot of the Trainer choices are standard choices that allow you to draw extra cards or switch you or your opponent's active Pokemon (or both). 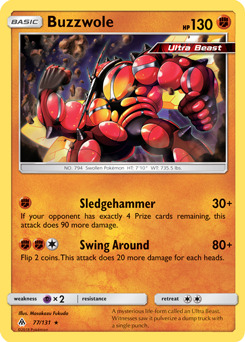 Rescue Stretcher is a great way to return a KO'd Buzzwole or Buzzwole-GX to your hand. Beast Ring is a great way to accelerate your energy for any Buzzwole you have in play. Brooklet Hill is a great stadium to play that helps you find you fighting-type Pokemon every turn. It's also a great counter if an opponent plays a Shrine of Punishment. I also want to mention that Lycanroc-GX is also a pretty important member of this team. Its Bloodthirsty Eyes ability allows you to switch one of your opponent's benched Pokemon with their active Pokemon when Rockruff evolves into Lycanroc-GX, which can allow you to pick off an already damaged Pokemon that your opponent may have retreated from the battlefield. By choosing your target carefully you can maximize the effect for your benefit. The second type of deck I wanted to discuss today is the Psychic Malamar deck. Here's a recent example of this style of deck. The goal of this deck is to get as many copies of Malamar into play and onto your bench. 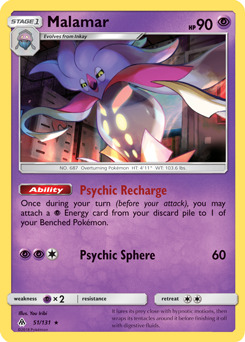 Malamar's Psychic Recharge ability allows you to attach a Psychic Energy card from your discard pile to one of your benched Pokemon. Because of this, you'll likely be able to attach multiple energy cards per turn and your preferred targets are Necrozma-GX or Dawn Wings Necrozma-GX. Necrozma-GX has the Prismatic Burst attack, which will make you discard all Psychic Energy from it in exchange for an absurd amount of damage. 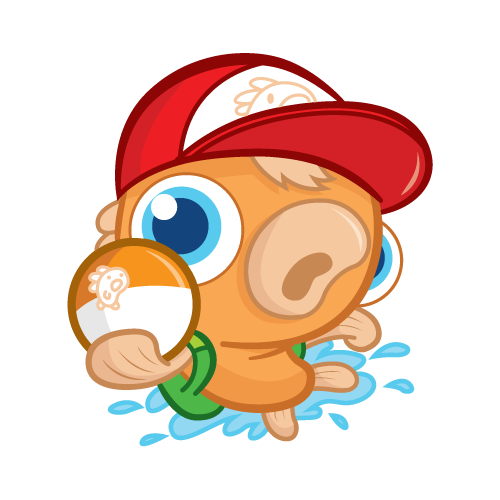 You'll likely be able to OHKO (One Hit Knock Out) your opponent's active Pokemon with this attack. The following turn you can switch Necrozma-GX with Dawn Wings Necrozma-GX by using Dawn Wings Necrozma-GX's Invasion ability after you've charged it with the energy provided by Malamar. The following turn, you can retreat Dawn Wings Necrozma-GX by discarding energy from it and send in Necrozma-GX again. The energy that you discarded to retreat can immediately be reattached thanks to Malamar. Continue this cycle until victory is achieved. As usual, you have a variety of trainers that help you draw additional cards and switch both you and your opponent's Pokemon. You also have four copies of Escape Board, which are great when attached to Dawn Wings Necrozma-GX as you'll be able to lower its retreat cost to a single energy instead of two. That can be important when Malamar recharges your benched Pokemon. Mysterious Treasure is an important card for this deck as well. In order to use it, you'll need to discard a card from your hand. The best card to discard will either be a Psychic Energy or a basic Pokemon. The Energy card can always be recurred thanks to Malamar, and the basic Pokemon can be useful thanks to the Shadow Hunt ability of Marshadow-GX. Mysterious Treasure not only helps shape your discard pile to your liking, but it also puts the missing piece of your combo right into your hand. Zoroark-GX decks, Buzzwole and Buzzwole-GX decks, and Malamar decks make up a huge portion of all of the competitive decks used in Standard. None of them is clearly the strongest thanks to the weakness of each deck. Zoroark-GX decks are generally weak to Fighting types, like Buzzwole & Buzzwole-GX. Buzzwole & Buzzwole-GX decks are generally weak to Psychic types, like Malamar. And Malamar decks generally have a few cards that are weak to Dark types, like Zoroark-GX, and other Psychic types. This is similar to Rock-Paper-Scissors where each deck has a different deck in the format that keeps it in check. Will this balance be upset when Lost Thunder releases in a few weeks on November 2nd? Time will tell, but I have a feeling that things are about to shake up. What do you think? Let me know by leaving a comment below or you can reply to me directly on Twitter (@mikelikesmtg), or email me directly at mikelikesmtg@gmail.com. And be sure to join me here again next week. I'm hoping to take a look at a few of my favorite cards from Lost Thunder. I'll see you then!